This mini may not have any crazy conversions but the painting on it is top notch. When you consider how large this model is, the level of smoothness he has achieved is pretty astounding. 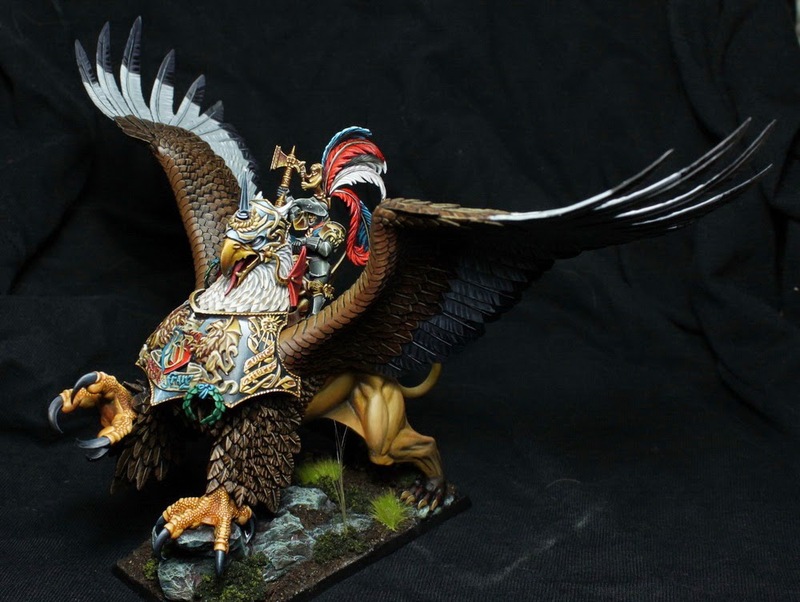 One of my favorite things about this Karl Franz is just how rare it is to see a top level paint job on it. The color choices really pop against each other, with nothing really overwhelming the rest. Generally I am not a huge fan of Non-Metallic metals, but I really like it on this. I feel like it gets overused just to show off how good the painter is, not because it is needed on the mini. The "gold" of the hammer compliments the yellow of the beak and claws. It also helps Karl Franz blend in more with the piece as a whole. 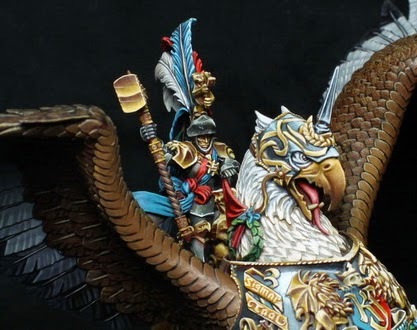 If he were painted in true metallics there would have been the risk of him being too shiny and distracting from the Griffon. The one thing I feel that is lacking is the base. It is just to plain for how much attention has been put into the rest of the model. He didn't need anything crazy, but just a little something, maybe some battlefield detritus or something.